Aspen developed a cold plate to chill/maintain chemicals at a constant temperature in preparation for laboratory experiments. Aspen worked with a customer to define the laboratory cold plate. The cold plate system allows the user to select the cold plate surface temperature. 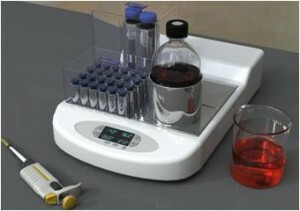 The customer wanted a sufficient surface to chill several vials or other glassware on the lab bench without having to continuously use a refrigerator. The surface of the cold plate chills the contents of the glassware during experiments so the experimenter has all chemicals on hand and need not worry about chemicals warming to room temperature while waiting to be used for an experiment.